Slow cooker bread pudding made with fresh bread. Crockpot dessert recipe for the win! Bread pudding made in the crock pot. Admittedly, I don’t use my slow cooker for many things. I wish I did, though. I so desperately need to rely on a slow cooker to get dinner on the table faster, but I find things made in the crockpot taste like…all the other things made in the crockpot. You know what I mean? I almost kicked it to the curb. Almost. And then, I started making small batch desserts in the crockpot. I first made Creme Brûlée in the Crockpot, which is so fun because it takes all the guess-work out of making custard. Plus, it’s a hands-off easy way to make a fancy dessert! Effortless and impressive is always the way to my heart. So, I started thinking about what else I could put in ramekins and bake in a water bath in my slow cooker. Bread pudding came to mind. And like most things, I sat on the idea for a long time before finally attempting it. I was waiting for a craving for a warm, gooey spiced dessert to hit. And since we almost got a chill long enough to kill the mosquitos, I went for it. 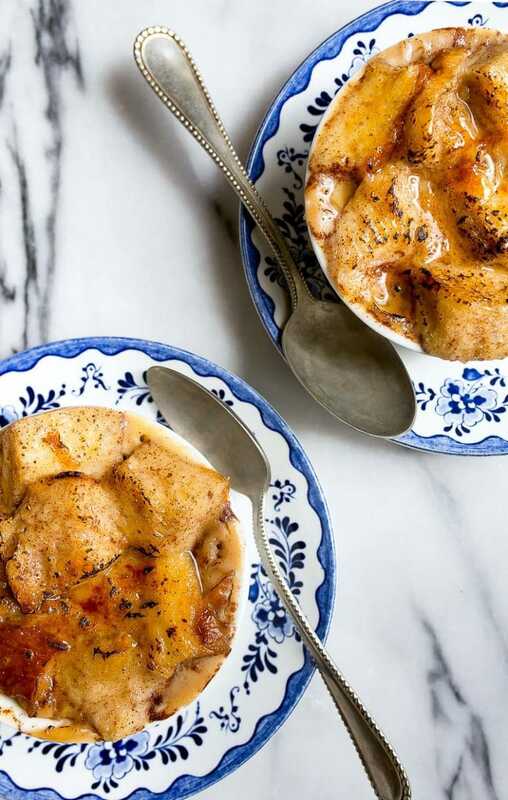 Can you double this slow cooker bread pudding? What kind of bread is best for bread pudding? This is a basic recipe, your jumping-off point, really. 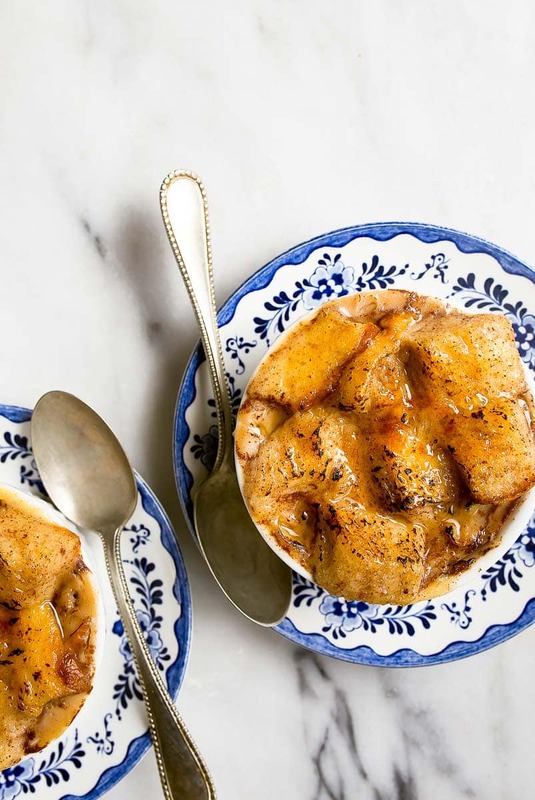 In my opinion, the one thing I think that makes bread pudding recipes stand out from the crowd is the use of challah bread. Challah is an enriched bread made with plenty of eggs. This recipe for slow cooker bread pudding has challah bread, eggs, milk, cream, sugar, and cinnamon. I wanted to add rum-soaked raisins, but you guys can get violent over such things. Let’s also talk about something else important: sogginess. So, the water bath in the slow cooker makes for the most incredible tender custard, but the same thing goes for the top. I love a little crunchy top in my bread pudding, so I sprinkled it with sugar and hit it with a kitchen torch. It’s totally your choice. Just like it’s totally your choice to pile it high with whipped cream and eat both servings. PS There’s a recipe for a whiskey sauce that would be amazing on top in the Dessert for Two book. But in lieu of that, I recommend this easy, homemade, small-batch salted caramel sauce! 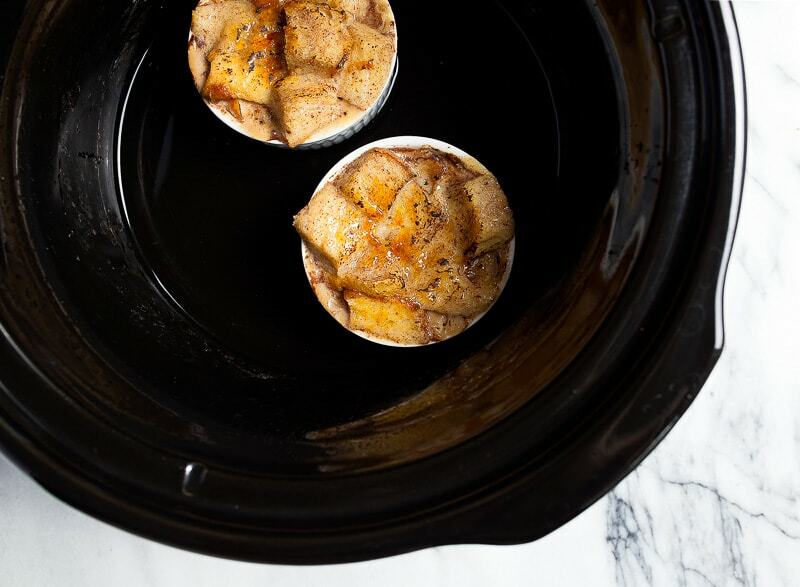 Slow cooker bread pudding for two, made in ramekins. So easy! In a medium bowl, whisk together the eggs, milk, cream, vanilla, sugar and cinnamon. Whisk very well to dissolve the cinnamon. Add the bread cubes, and toss to combine. Divide the mixture between two ramekins. In the bottom of a slow cooker, place two rings of foil for the ramekins to sit on. I take 2 12-inch pieces of foil, roll them up into a snake, and then make a circle out of each one. Place the foil circles in the bottom of the slow cooker, and place a ramekin on top of each one. Pour about 3 cups of hot tap water around the ramekins, being careful not to splash the water into the bread pudding. Cook on LOW for 2-3 hours, testing after 2 hours. If you stick a toothpick into the custard, it will come out clean. Remove the lid from the slow cooker, and let them cool slightly before carefully lifting them out of the slow cooker. I like to serve them warm with a little scoop of ice cream. 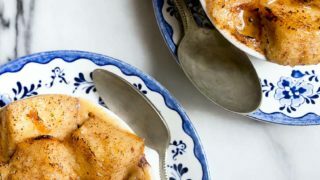 *If you like a little crunch, sprinkle an extra teaspoon of sugar on top of each pudding, and caramelize with a kitchen torch until crunchy (like making creme brulee). Hello I know this is slow cooker but can we cook this like a little faster I mean 2 hours is more do you suggest something else. Sounds good! But typo alert – the ingredient list says “2 cubes fresh bread cubes” – I’m guessing that should be 2 cups? HAHA, yes, 2 CUPS, sorry, Susan! As for the foil rings do they lift the ramekins off the bottom about 3/4-1″, I hav a meat rack for my crockpot so planning on using that instead. Also does the water come 1/2 way up the dishes? Not all crock pots are the same size so I want to sure the water measurement is correct for mine, depending on which one I use, I have 4 different crock pots 1 1/2qt, old school 5qt, newer 5qt and a 6qt. Oval one. This is just perfect dish for colder days ! Where on Earth did you get these plates ? They are amazing ! Hi there, thanks so much! They were my grandmother’s. I wish I could help more! Bread pudding is a serious weakness of mine! These look too good not to make! btw the recipe and the plates, I’m swooning!!! looks so good. What if you don’t have ramekins cups ?, can this be put straight into 1.5 slow cooker and how long to cook ? Not sure, haven’t tried that. Do you have any glass mugs? Tried this today – really good. Instead of the Aluminum foil rings I used mason jar canning rings (wide mouth). worked perfect.